Braig (formerly known as Xigbar) is an antagonist in the Kingdom Hearts series. He is a cocky, laid back individual who always seems to treat everything like a joke. His home world is Radiant Garden, and was one of Ansem the Wise's six apprentices as well as a guard of the castle. However, after he met Master Xehanort his allegiances changed and he developed an alliance with the Keyblade Master in order to obtain the power to wield his own keyblade. In battle, he wields a pair of guns which can be fastened together to form a weapon similar to a sniper rifle and controls the element of space. he also has complete control over the Sniper nobodies. 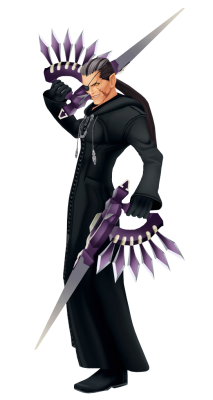 During the events of Kingdom Hearts 358/2 Days and Kingdom Hearts II, Braig was a nobody named Xigbar, having been turned into a nobody after Xehanort used his No Name keyblade to remove Braig's heart. Xigbar was ranked number 2 in the original Organization XIII. Braig will appear as a member of the "true" organization in Kingdom Hearts III.